What's That Worm in My Apple? 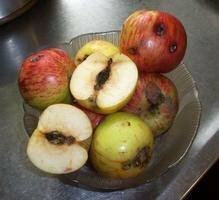 The first step in controlling the insect larvae that so often infest apples is identification. Once you know what it is, you've taken the first step in dealing with it. Here are some tips for identifying the most common species of larvae found in apples. People often complain about "wormy apples," but in fact the insect larvae that most often infest apples are either caterpillars, maggots or grubs. Understanding the biological life cycles of these pests is the first step to effectively controlling them. 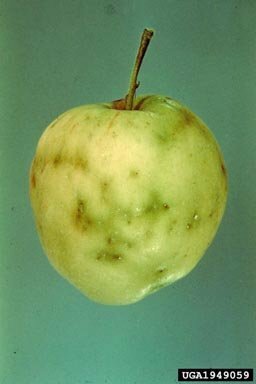 The larval form of the Codling Moth is probably the most widespread and destructive pest of apples in the world. It is a native of Eurasia, the home of the apple, but it has been in North America for 200 years. 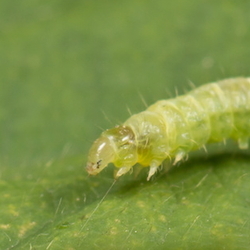 The larva is a small whitish caterpillar with a dark brown head. Like all caterpillars, it has legs, which distinguish it from other kinds of larvae usually found infesting apples. At full growth, it is about ½ to ¾ inch long. In most regions, at least two broods of Codling Moth hatch in a year. The caterpillars overwinter as larvae inside cocoons hidden in bark crevices on the tree, or nearby. With the coming of spring they pupate, and the first brood of moths emerges beginning about the time of petal fall and for some weeks afterward. 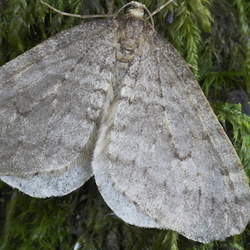 The adult moths are about 5/16 inch long and colored a light, mottled gray that makes them difficult to see on the bark of apple trees, with dark brown wingtips. The wingtips are the distinguishing mark that enables growers to identify them when caught in traps. They are active in the hours around sunset when the weather begins to be warm, at least 60 F. After mating, the females lay eggs on the leaves or stems, which hatch within 8 to 14 days, after which the larvae immediately begin to crawl in search of a young developing fruit. 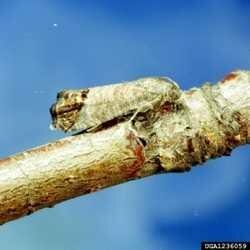 The period between the emergence of the adults and the hatching of the caterpillars is when the Codling Moth is most vulnerable. In early spring, growers can put out sticky traps baited with pheromone lures to catch the first emerging moths. This helps them calculate the best timing for spray treatments or other means of control. Some growers rely on traps to reduce the moth population or disrupt their mating before they can lay eggs. Once the larva has entered the fruit, it is safe. The first generation usually prefers to enter the apple at the calyx or blossom end. Unfortunately for the grower, it is difficult to spot the entrance holes in this location. Often small "stings" can be seen on the skin of the developing fruit where a larva took a bite but failed to enter the apple. Stings made in early spring are generally the sign of Codling Moth activity. 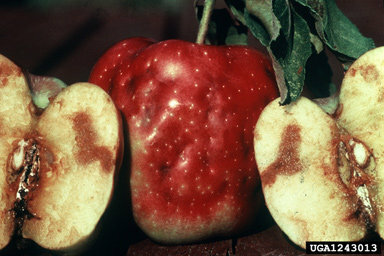 If a larva does not develop in the apple, these small blemishes usually heal and the fruit remains edible. Bagging the developing fruit is a successful, if labor-intensive, method of protecting it from the Codling Moth, but this must be done early in the season before the young apples are infested. Where the larva has successfully penetrated the fruit, the entrance hole enlarges and begins to show signs of rot. Frass, the excrement of the caterpillar, can often be seen there. The presence of external frass is another sign of infestation by the Codling Moth. Typically, after entering the fruit, the larva will tunnel into the core, where it feeds on the developing seeds for about three weeks. 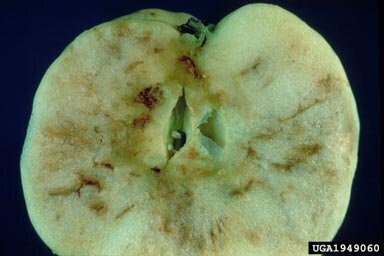 The core of an infested apple is usually filled with frass. The caterpillar remains in the fruit until maturity, when it exits through its original entrance or a new exit hole. It then crawls to the bark of the tree in search of shelter. If it is from the first brood of the year, it will probably pupate and hatch in midsummer to begin a second round of infestation; in warmer climates, there may be a third brood. This phase in the Codling Moth larva's life cycle offers one more opportunity for control. If bands of corrugated cardboard are fastened around the trunk and major limbs, a number of larvae may use the corrugations to pupate or cocoon. These bands can then be removed and the larvae destroyed. The apples infested by the first brood of Codling Moths usually die and fall from the tree after the caterpillar has left, but some fallen fruit may contain larvae, so that it is important not to leave it on the ground where the larvae might emerge. The larvae that pupate will hatch into a second brood of moths. The larvae of this second brood are more likely to tunnel into the fruit at any point, leaving conspicuous entry holes where frass is often evident. The larvae found in mature, harvested apples are usually from the second brood. Often, however, by the time the apple is picked, the larva has already departed the fruit to cocoon and wait for the next year. 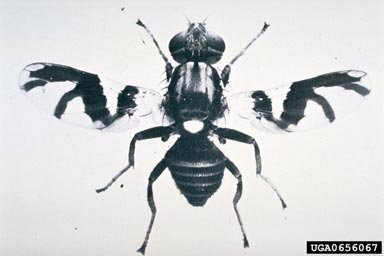 The Apple Maggot Fly is named for its larvae, one of the most serious pests of apples in eastern North America, where it is a native species that originally infested hawthorns. Several closely related species attack cherries and blueberries. 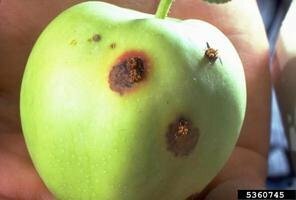 The Apple Maggot is also known as the Railroad Worm, for the brown tracks that it leaves inside an infested apple. The Apple Maggot is a creature of midsummer. If something is attacking an apple orchard in springtime, it is some other pest. 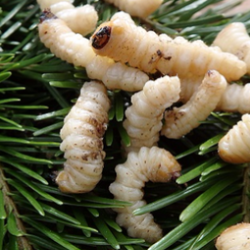 The maggots pupate in the soil beneath the trees until June or July in most apple-growing parts of the U.S., when they begin to emerge as small dark flies about ¼ inch long, with a white spot on the back and brown-banded clear wings. In some positions, the wings mimic the shape of a lurking crab spider, repelling some potential predators. Detection of the time of emergence is crucial for controlling the population, as its primary period of vulnerability is during the week to ten days between emergence and the beginning of egg-laying. To be effective, any sprays must be timed for this period. Many growers place traps containing pheromone lures in the orchard to alert them to the presence of the adult flies. Unfortunately, the adults do not all hatch at the same time, so that monitoring must be carried out until the end of August. 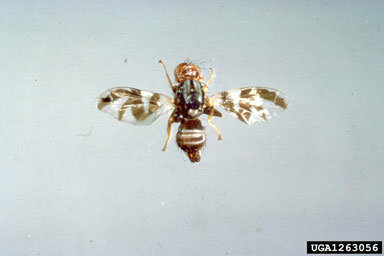 The female fly, after mating, uses its sharp ovipositor to pierce the skin of apples and insert its eggs. The female may live for a month and lay 300 eggs during that time. The damage is at first only a pinprick, but the scars from these stings distort the shape of the apple as it grows, often leaving it lumpy and unattractive. On light-skinned fruits the skin is sometimes blemished from the presence of the tracks made by the maggots inside. Bagging the fruit prevents the fly from laying its eggs. 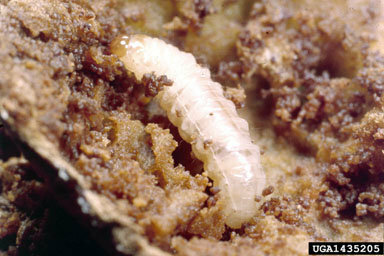 The maggot is pale and small, about 1/3 inch long at maturity. Like all maggots, it has no feet or head capsule. This distinguishes it from other larvae commonly found infesting apples, such as the Codling Moth. 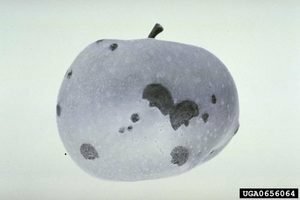 But in fact, the maggot can be hard to spot, given its small size and the similarity of its color to the flesh of the apple. There is no visible frass, but the brown trail of rotting pulp that it plows though the interior of the fruit is unmistakable. The mature maggot usually waits for the apple to fall, when it leaves the fruit and burrows a couple inches into the soil, where it pupates until spring. There is only one brood of flies per year in most of its range. This insect is a more serious pest of stone fruit than apples, but it does a great deal of damage to apples in the eastern part of North America, where it is a native species. It is an ugly-looking snout beetle, or weevil, less than ¼ long as an adult, mottled tan and black, with bumpy knobs on its wing covers. The beetles overwinter as adults in litter near the fruit trees where they hatched the previous year. They emerge in early spring and fly to the fruit trees to mate as the weather becomes warm; their activity is directly related to temperature. Depending on the weather, they are sometimes already present in the orchard during the pre-bloom period when they can do little damage; this is a time when they are vulnerable. In other seasons, they may not become active until after petal-fall. Unfortunately, there is no widely available monitoring system for detecting the presence of the adults. If the beetles are already present at petal-fall, they immediately begin to seek out the developing fruits to lay their eggs. 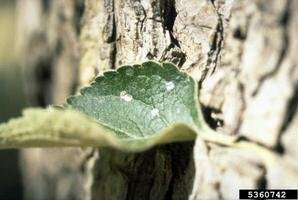 For this reason, bagging is a less effective control for this insect, as they may begin to do their damage before the young fruits are large enough to bag. On apples, the marks of plum curculio egg-laying are distinctive and easily recognized. The female cuts a semicircle into the skin of the fruit where she deposits a single egg just beneath the skin. This leaves a characteristic crescent or D-shaped scar. Each female may lay as many as 500 eggs during this period of activity. If the larva fails to develop, the scar may heal, leaving a russet, corky blemish on the fruit. 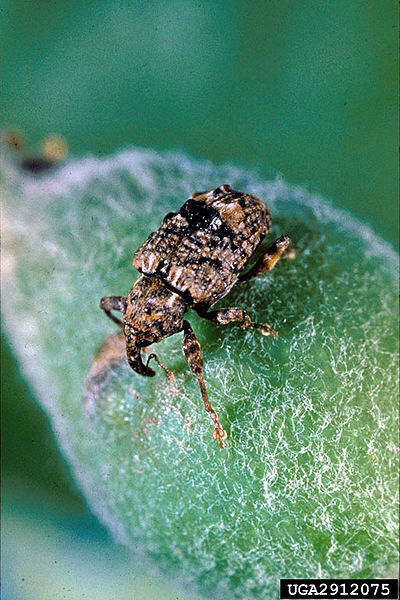 Although the plum curculio will often select apples as a host fruit for its eggs, a large percentage of the larva fail to develop in the hard flesh. Eggs hatch within a week, and the larvae reach maturity in just over two weeks. The larvae of weevils are grubs. The larval plum curculio greatly resembles that of the codling moth, being whitish in color, about 1/3 inch long, with a brown head. However, the plum curculio larva does not have legs, and its shape is slightly curved, as are most grubs. There is no external frass. Once hatched, the larva will head towards the center of the fruit, where it consumes the developing seeds. In stone fruit, the young fruits usually abort and fall to the ground, where the mature grub enters the soil to pupate. In the case of apples, infested fruits usually fall during the "June fruit drop." Prompt removal of dropped fruit is a crucial step in control of this pest. There is a visible exit hole if the larva has already left the fruit. After pupation, adult beetles emerge from the soil in about thirty days, after which they feed on the developing fruit until they enter hibernation in the fall. In the case of stone fruits, this activity often introduces the spores of brown rot and leads to loss of the fruit. In the case of apples, the feeding scars usually heal as oviposition scars do, leaving the fruit blemished but edible. In the northern part of its range, there is only one generation of beetles, but further south there may be a second round of egg-laying. Particularly in early-maturing varieties of apples, the larvae of this second brood have a better chance of survival to maturity. One thing these different larvae have in common is that once they are inside your apple, the damage is already done. Whatever methods you choose for controlling them, the first step is knowing at what stages in their life cycle they are most vulnerable. Further information on bagging apples can be found here. Photo Credits: I am grateful to the Bugworld Network for allowing use of their photos. Damage to Apple 5360745: Eugene E. Nelson, Bugworld.org This work is licensed under a Creative Commons Attribution-Noncommercial 3.0 United States License. Eggs 5360742: Eugene E. Nelson, Bugworld.org This work is licensed under a Creative Commons Attribution-Noncommercial 3.0 United States License. Adult Moth UGA1435202: Clemson U, USDA Cooperative Extension, Bugworld.org This work is licensed under a Creative Commons Attribution 3.0 United States License. Larva UGA1236187: Clemson U, USDA Cooperative Extension, Bugworld.org This work is licensed under a Creative Commons Attribution 3.0 United States License. Adult Fly 0656067: Central Science Lab, Hapendon Archive, British Crown, Bugworld.org This work is licensed under a Creative Commons Attribution-Noncommercial 3.0 United States License. Adult Fly 1263056: Central Science Lab, Hapendon Archive, British Crown, Bugworld.org This work is licensed under a Creative Commons Attribution-Noncommercial 3.0 United States License. Damage to Apple UGA1949060: E.H. Glass, NY State Agricultural Experimental Station, Bugworld.org This work is licensed under a Creative Commons Attribution-Noncommercial 3.0 United States License. Damage to Apple UGA1949059: NY State Agricultural Experimental Station Archives, Cornell U, Bugworld.org This work is licensed under a Creative Commons Attribution-Noncommercial 3.0 United States License. Damage to Apple UGA1243013: Whitney Cranshaw, CO St U, Bugworld.org This work is licensed under a Creative Commons Attribution 3.0 United States License. Adult Beetle UGA 2912075: Clemson U, USDA Cooperative Extension, Bugworld.org This work is licensed under a Creative Commons Attribution 3.0 United States License. Larva UGA1435205: Clemson U, USDA Cooperative Extension, Bugworld.org This work is licensed under a Creative Commons Attribution 3.0 United States License. Damage to Apple UGA0656064: NY State Agricultural Experimental Station Archives, Cornell U, Bugworld.org This work is licensed under a Creative Commons Attribution-Noncommercial 3.0 United States License. Retired from writing novels about vampires, I'm turning to parasitic plants and invasive weeds.